Having found a cap screw profile I like, I wanted to be able to repeat it for future planes. Since I don’t have CNC, that means template cutting. Here are the two templates I made and the results. 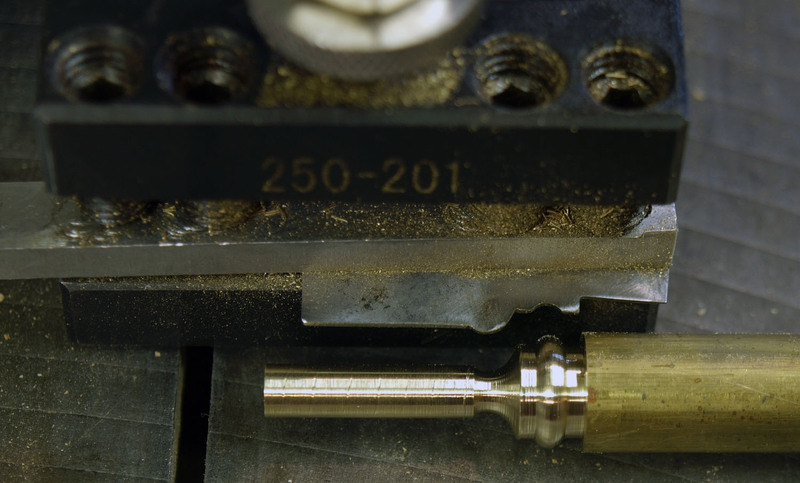 These are little bitty screws, the shank is ¼”, for block planes or spokes shaves, maybe a Stanley scrub. 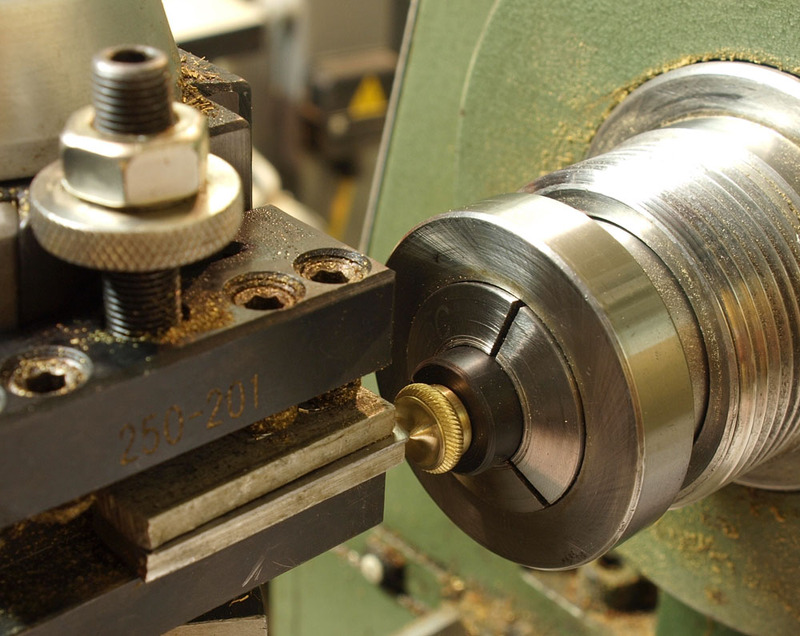 The templates were made from 0.032″ spring steel (cut from a saw plate) and shaped with a grinder and files. You can see the test tracings I made while shaping. 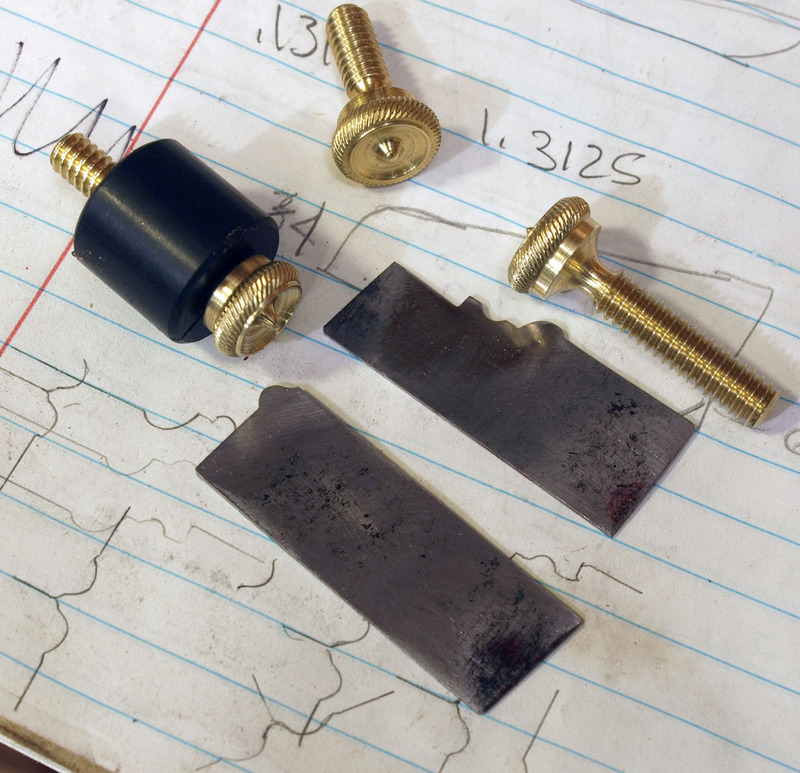 These are the same as scratch stock for wood with the addition of a relief angle on the trailing edge (ie they are sharpened like a very blunt chisel); otherwise, they will rub the brass instead of cutting it (if I were to make an angled [scratch stock like] holder, I could use a 90º angle). The top is honed just like a chisel back. 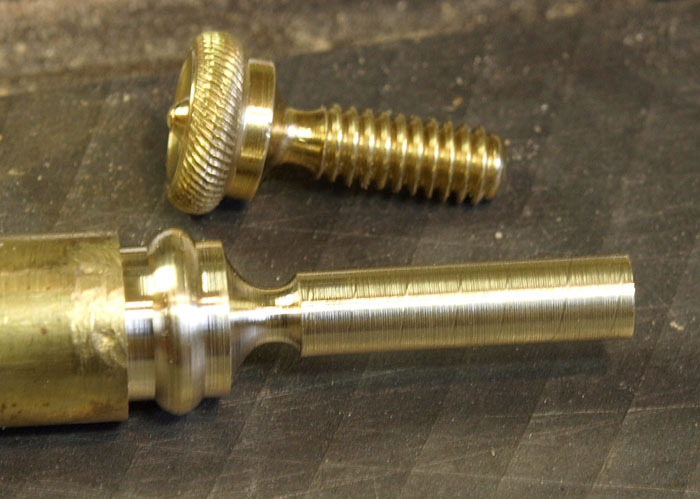 To make the parts, I start with brass rod (9/16″ in this case) and turn a ¼” shank for the threaded portion. Then I can turn the profile. Then thread the shank. 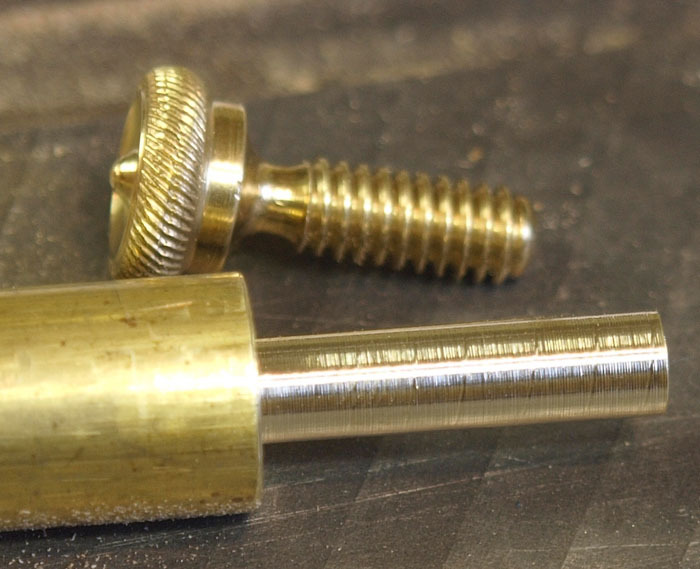 For these small screws, the small neck bends pretty easy so I like to capture both ends, turn the threads and chase with a die. 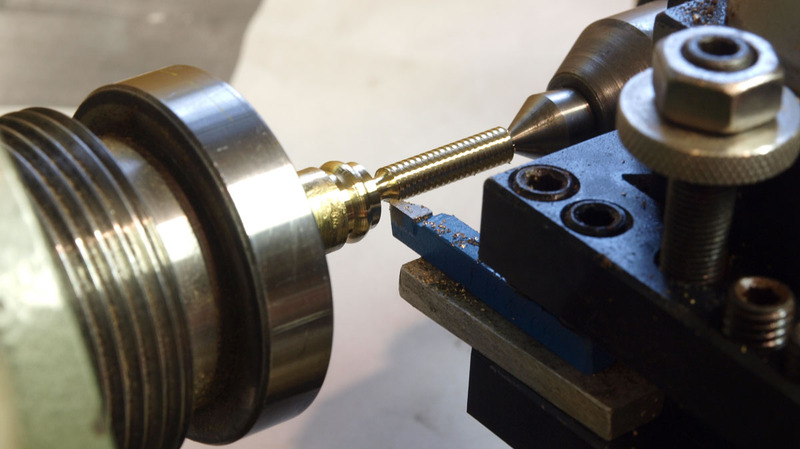 The cutting tool hangs out a couple of miles because the tool post hits the live center. The aluminum block adds support. 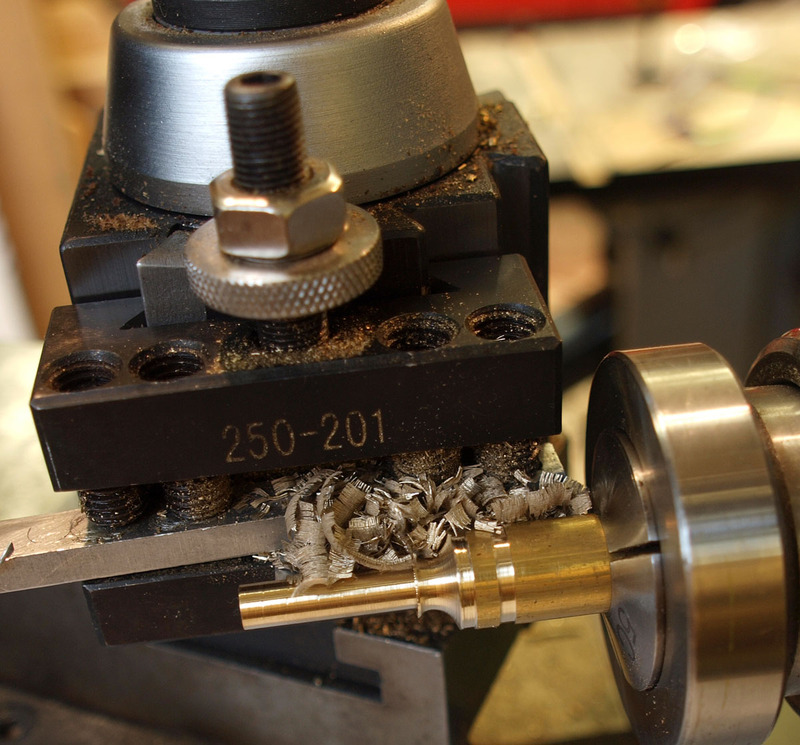 Then the “rope” is knurled. I still haven’t gotten around to making a rope knurl so I knurled these by moving the tool post around (as covered in a previous post). Then the top is cut. Again, I have to worry about twisting the cap off the shank so I made a plastic plug for support. It is threaded and counter sunk so the base of the cap is fully supported. The plug has slice down the side so the threads can be squeezed good by the collet (and more importantly, I can unscrew the cap by hand. Guess how I learned that one). The template is wider than the tool post (doh!) so I sandwich it to give it good support and keep chatter at bay. Burrs and such are cleaned up with needle files (while spinning; file “safe” edges are good) and polished with some fine steel wool. This entry was posted in Planes, Tools. Bookmark the permalink.